Honeywell - HFD-120-Q : Air Purifier Review • The Air Geeks, reviews of air conditioners, dehumidifiers and air purifiers. The air we inhale contains different types of pollutants. The concentrations vary from one place to another depending on a variety of factors. The concentrations tend to be higher in enclosed spaces. The specialist in air treatment units, Honeywell, founded in 1906 and headquartered in New Jersey, introduced the HFD-120-Q a few years ago : a compact and quiet air purifier that is optimized to remove different types of airborne pollutants from the air that goes through it, this system ensures that the air in your room is clean and fresh. This Energy Star rated air cleaning system combines various filtration mechanisms in three speeds, to ensure that various airborne pollutants are trapped before they reach your respiratory system. If you are planning to purchase an air purifier for your home, then you might want to consider this powerful unit. It offers some great features and its performance is good for its size. Enough to warrant a purchase? Let us take a deeper look. Air purifiers utilize a variety of mechanisms to remove airborne particles from the air that goes through them. Most of them use a combination of filtration methods to remove the pollutants from the air. 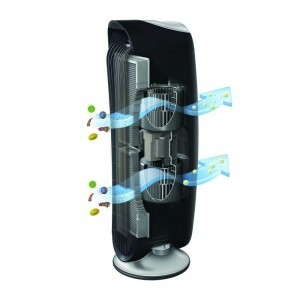 This air cleaning unit has three cleaning levels to ensure that the air it discharges is fresh and clean. Optimized for space between 100 and 200 square feet, the AHAM certified unit boasts an HEPA filtration mechanism, one of the most effective methods used for air purifications. The HFD-120-Q utilizes this mechanism to remove various pollutants from the air. In addition, this unit features a permanent IFD filter. You can easily remove dirt from this permanent filter by vacuuming or washing it. This durable filter does not need replacement. This combination of mechanisms enables this air purifier to capture up to 99% of airborne contaminants. An ionizer works by targeting charged particles that are suspended in the air. This air cleaner features a built-in ionizer that is capable of grounding most of the charged particles before they get to your nose. You can easily remove the grounded particles by vacuum cleaning. The HFD-120-Q combines different filtration approaches to remove the pollutants from the air that goes through it. This air purifier is effective in removing various airborne pollutants including pollen, pet dander, dust, and tobacco smoke. Air contaminants come in different sizes and types. Most of them are small and invisible to the naked eye. The HFD-120-Q is optimized to capture even the smallest particles. This air purifier is capable of capturing particles that are as small as 2 microns. With this capability, you can be sure that the air discharged into your room is free from pollutants. What we liked about this unit, and is definitely a differentiating factor, is the circulation of air. The HFD-120-Q is specially designed to deliver an impressive rate of air circulation. According to the manufacturer, this unit is capable of circulating the air in your room up to five times in one hour. At this rate, no section of your room will have stagnant air. The HFD-120-Q is a quiet air cleaning unit that purifies air without producing sounds that bothers you. It runs quietly and this makes it ideal for use in bedrooms and other places that demand a quiet environment. Furthermore, this air cleaning unit is ENERGY STAR rated. It is designed to consume minimum energy. Quiet air purifier. This air cleaner is designed to run quietly. It is suitable for use in bedrooms and other places that require quietness. Easy maintenance. The system features a permanent IFD filter. You can easily remove the trapped particles by vacuuming or cleaning it. I decided to get this air cleaner after trying the Sharper Image Ionic Breeze and a larger Honeywell HEPA filter. At the time of purchase, the Sharper Image was the only one with a permanent filter. This was a big plus for me seeing as the older HEPA cleaners have 2 filters to replace, the larger one being nearly the price of the machine. This Honeywell tower has a permanent filter. There are many claims for and against the Ionic Breeze. I'm still undecided on how effective it is -- but I feel almost the same way about my large HEPA filter. I found myself running both of them to control my allergies. Although I cleaned them regularly and found dust on both, I can't say the air was particularly different. However, shortly after turning this on in the bedroom for the first time, I could smell a difference. I haven't had it long enough to say it's made a real dent in my allergies -- plus the fact that my allergies are intermittent -- but I'm pleased that I even notice it." I'm using it for the baby's room. Thus far, it has performed very well. I especially like the fact that the filters don't need to be repurchased. Approximately a month or so of usage, I simply take the filters out and clean them. This product offers good quality for a very attractive price." The HFD-120-Q tower air purifier is a quiet system that combines various filtration mechanisms to ensure that your room gets clean and fresh air. This energy-efficient unit features a permanent filter that is washable and does not require replacement. 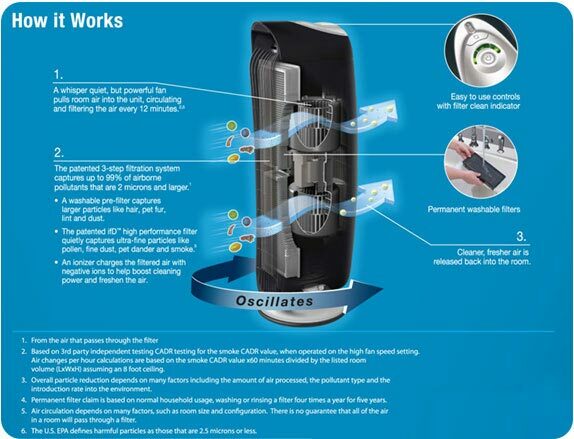 It is easy to maintain this air purifier, which has an affordable price and maintenance cost. However, the highly effective true HEPA filter truly lacks in the design of this small-surface air purifier. This is, for us, key for users with asthma or allergies – others will do fine without it.